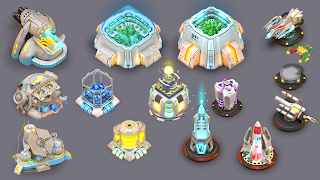 My buildings for a Clash of Clans type game, but in a sci-fi theme. This project was cancelled, but the producers were very happy with the graphics and how the game look. That was very satisfying, because that was my responsibility, and the producers were from a very famous overseas publishing company.